On Thursday, January 31st, the world recognizes International Day of the Zebra. On this day, we celebrate our own zebra dazzle: individuals living with Ehlers-Danlos syndromes (EDS) and hypermobility spectrum disorders (HSD). So the zebra became our symbol to mean, “Sometimes when you hear hoofbeats, it really is a zebra.” Ehlers-Danlos syndromes are unexpected because they’re rare. Hypermobile spectrum disorders are common but are unexpected because they remain misdiagnosed or under-diagnosed. Living with EDS/HSD is not always easy. We take comfort and pride in the strength and support of our community. Together, we dazzle! How to raise awareness about EDS/HSD on International Day of the Zebra? Show your stripes! When people ask you why you are covered in zebra, take the opportunity to tell them about EDS and HSD. Encourage your friends and family to show their support by wearing zebra stripes. Share our “Why the Zebra” presentation. We have this in video, slideshow, and pdf format on our website. The video will be available as a social media post. Tell the world what being a zebra means to you. 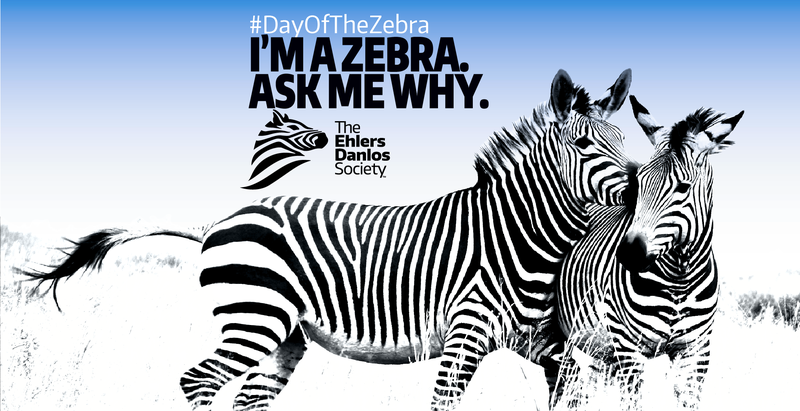 Add our #DayOfTheZebra frame to your Facebook profile picture. Use our #DayOfTheZebra Facebook cover. Go Wild! Tell us how you celebrated International Day of the Zebra by posting on social media using hashtag #DayOfTheZebra.